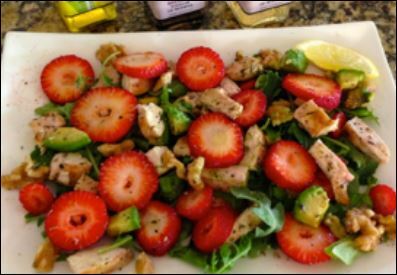 Pick up some strawberries from your local fresh fruit stand and prepare this light and tasty summer salad. With super foods such as avocados, walnuts, spinach and strawberries in this dish, you will feel good serving this up to your friends and family. For the olive oil and vinegar dressing, I also used local growers, Michael and Monika from Calolea Farms just up the road from Sacramento. Enjoy on the LCD and MD Key Diets. 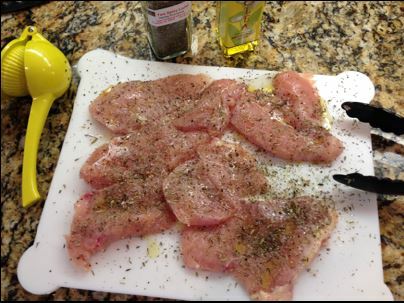 Prepare the chicken breasts by sprinkling herb seasoning, juice of whole lemon, olive oil and a bit of salt and pepper on both sides of the meat. Let sit for 10 minutes. Get the grill or grill pan ready. 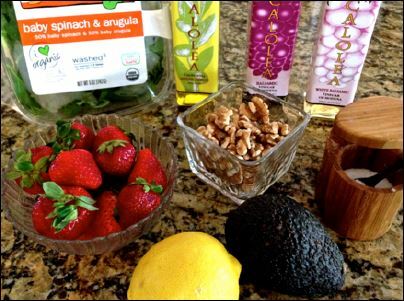 Slice the avocado and strawberries. Grill the chicken until fully cooked, but not dry, for about 4 minutes on each side. Slice into small strips. In one large bowl, mix all ingredients, except the spinach, together. Be carefull not to smash the strawberries. Sprinkle with salt, pepper and drizzle with olive oil and white balsamic vinegar or lemon juice. Add one cup of fresh spinach to each plate and top with the strawberry/chicken mix, distributing equally. Add a bit of lemon zest to top it off. Marinate the fresh strawberries in dark balsamic vinegar for 5 minutes for a deep, rich flavor. Add some fresh goat cheese or crumbled bacon. Replace strawberries with grapes or raspberries. Each serving contains: 32 gm Protein, 25 gm Fat, 5 net Carbs.